Night cream for delicate and sensitive skin types. Soothing and caring skin night cream that protects against harsh environmental influences. 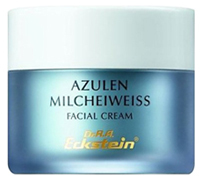 Contains azulene in a rich oil cream base with lactic albumin and lanolin. The lactic albumin calms and balances, which is supported by the chamomile oil with its anti-inflammatory ingredient, azulene. Vitamins A + E, and natural plant oils are also included that nourish, soften and smooth the skin. Ideal for improving nose or face redness and the constitution of the skin.